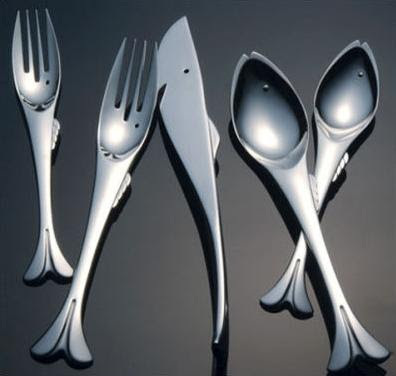 Fish Cutlery: "Each piece in this stainless steel cutlery set is whimsically fish-shaped, right down to tail, fins, mouth, and eyes." 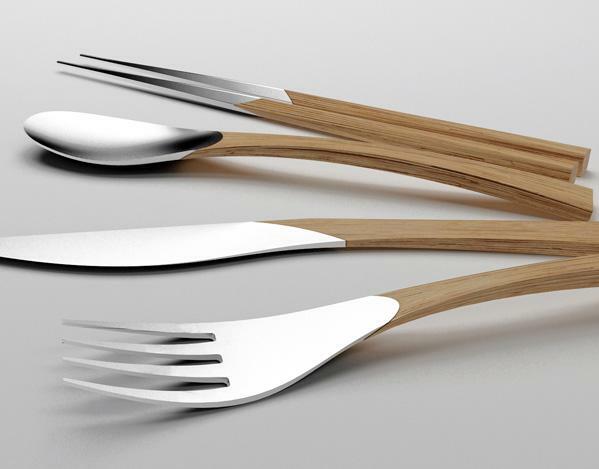 Gardening Tool Cutlery: Soil, a range of cutlery inspired by gardening tools is the creation of London-based designer Vladimir Rachev. IC3 concept: "The IC3 concept consists of a computerized shaft with 3 interchangeable eating apparatuses; fork, spoon, and knife. 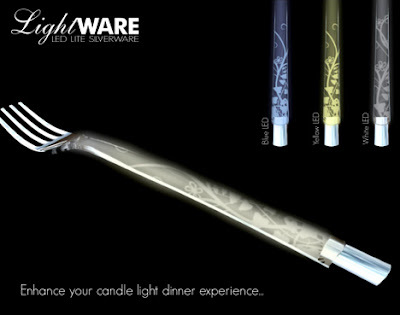 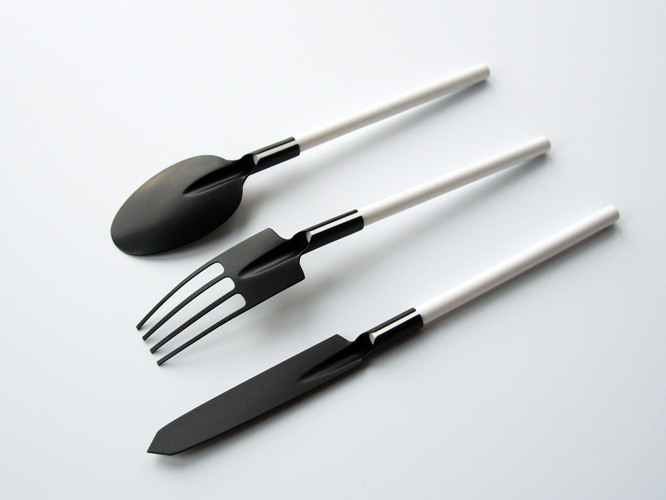 The fork analyzes composition such as fat, protein, sugars. 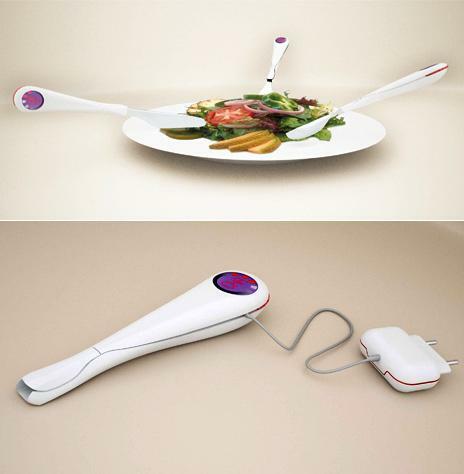 The spoon measures weight, and the knife takes temperature readings. Together this info creates a detailed report on what you're eating." 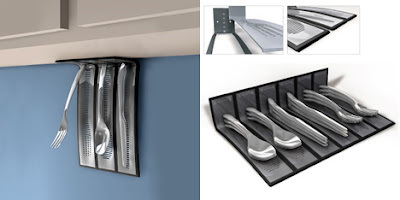 Simpleware by Sean McGreevy: Made from martensitic steel with magnetic properties, it can be stored upright, within the cabinet, or in the drawer. Famia - Feminine Cutlery by Mulu+Milano Design Studio: The outlines of these are so soft, smooth, curvy and feminine and would look beautiful on the dining table. 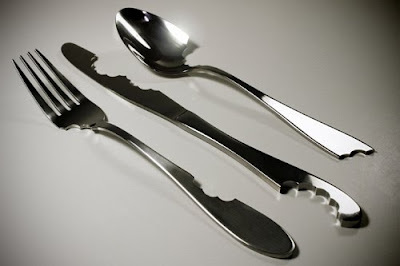 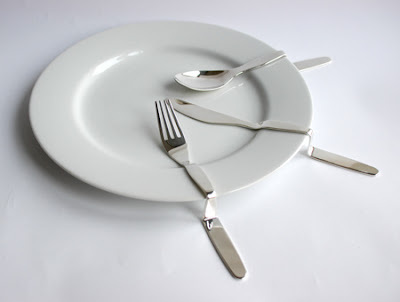 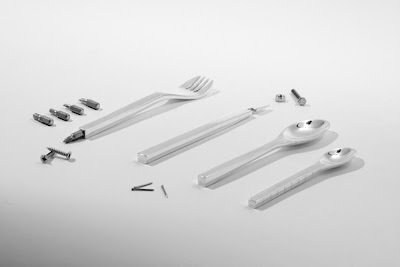 Shape/Form Cutlery: Cool cutlery set designer by Lukas Peet. Steve's Cutlery: Each of these are handcrafted and have their own character. 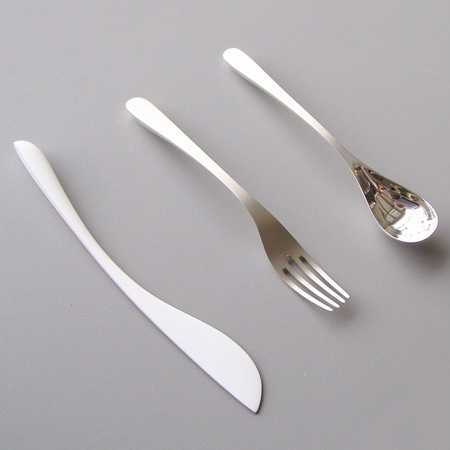 Ribbon Cutlery: Beautiful stainless steel cutlery designed by Makoto Yamaguchi. 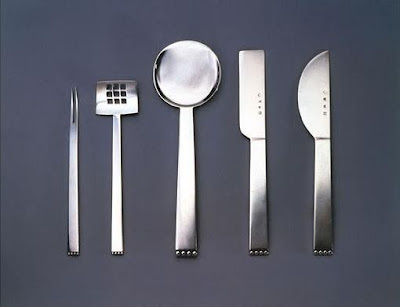 Flat Cutlery: Flat model flatware series by J Hoffman. 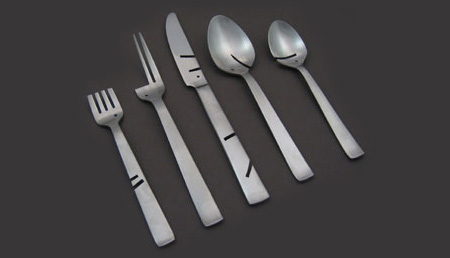 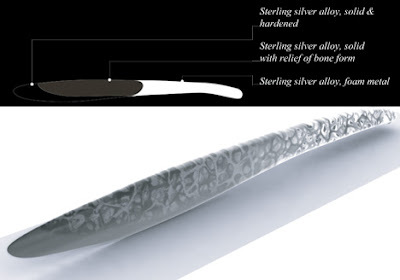 Hinton's Cutlery: Cool cutlery follows the shape of objects it appears to be kept onto. 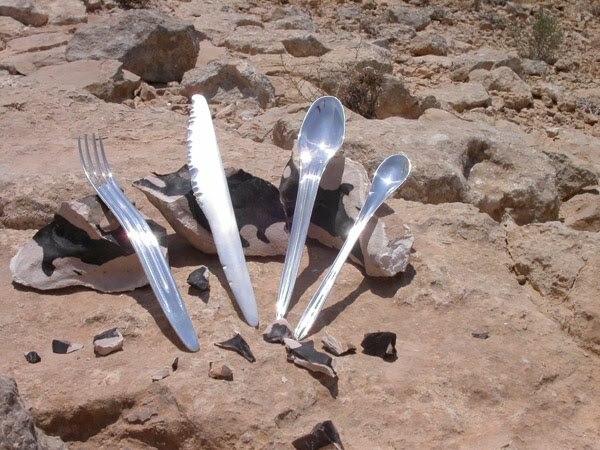 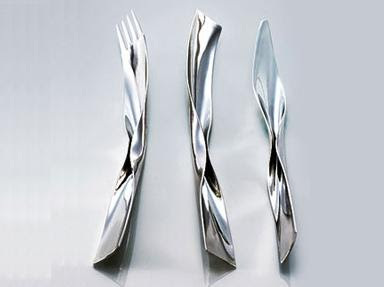 Origin Cutlery: Designed by Eynan Kimhi, inspired by the very first human feeding means: teeth, nails, and hand palms. 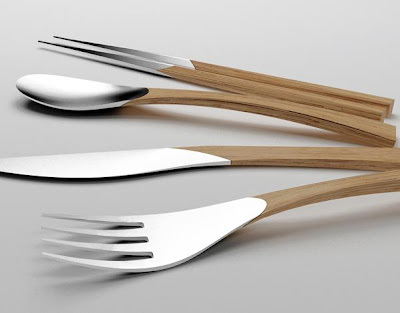 Natural Cutlery: Designed by Clara Del Portillo and Alejandro Selma, it beautifully merges traditional silver cutlery with the elegance of wood. 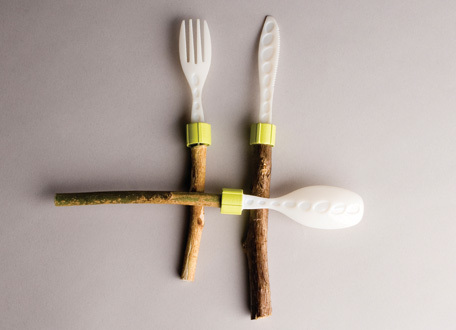 Anafim Outdoor Cutlery: All you need to do is to choose a twig and attach it to the needed tool and you have a fork, knife or spoon.